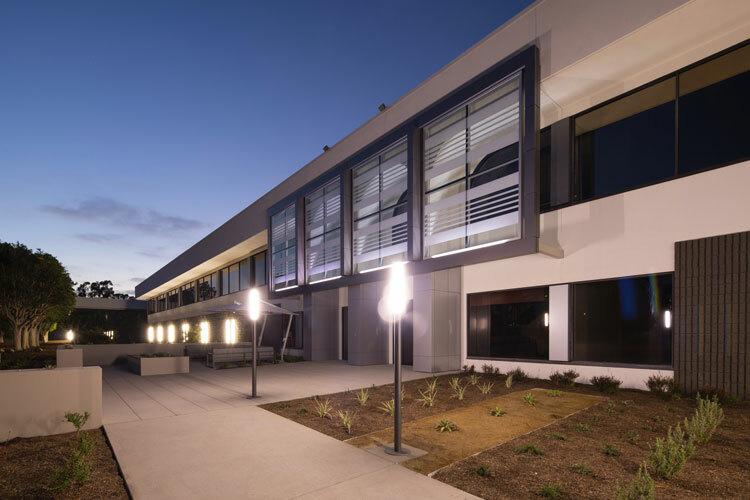 Irvine, Calif. — Ware Malcomb announced that construction is complete on the exterior renovation of Katella Office Campus in Los Alamitos, Calif. Ware Malcomb provided architectural design services for the project. With two buildings totaling 149,916 square feet and situated over 9.6 acres, Katella Office Campus is ideally located on the border of Orange County and Los Angeles with easy access to numerous Southern California freeways and thoroughfares. Ware Malcomb designed the new exterior architecture of the front entry locations of both buildings using new aluminum composite metal panels and glazing. Site improvements to the front entries also included upgrading the concrete paving and adding drought tolerant landscaping. In addition, the firm provided site upgrades to the shared break patios behind the buildings, including new paving, landscaping and added seating. New exterior paint on both buildings completed the renovation. The General Contractor for the project is CDG Builders and the Developer is Lincoln Property Company. Ware Malcomb’s Irvine office specializes in the design of office, healthcare, industrial, advanced manufacturing, retail, hospitality and science & technology projects.